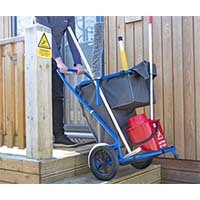 The janitors’ outdoor cleaning trolley that’s ideal for holiday villages and rugged terrain. The Vilcart trolley is designed for outdoor use with rugged back wheels and a waterproof cover to protect its contents from getting wet. It’s ideal for holiday parks, caravan parks and camping sites where there are several accommodations over a large area. And perfect when cleaning staff need to move their equipment outdoors between lodgings over all types of terrain such as grass, gravel and pavings stones. Thanks to its generous capacity, Vilcart allows the user to carry all of the necessary cleaning equipment at once within its generous and wide inner compartments, side straps and mesh base.